Anonymous person leaves post-it notes and chocorolls for Elias Rd Residents. “Such an act of kindness really touches the heart. I specially bought a pen and wrote a note to return the kindness.” – Miss Ruby, Civil Servant. Heartwarming notes filled with messages such as “Happy Thursday!” were everywhere. One resident decided to encourage his neighbours with these messages, each coupled with a mini chocolate Swiss roll. All 48 households of Blk 609 Elias Road received these messages and treats around 8AM yesterday. According to reports, this heartwarming act was initiated by a church member from “Heart of God”. He had pasted the colorful notes and Swiss rolls on the mailboxes of the residents. One of the residents, Miss Wang (20, Student) mentioned that her mother went down to retrieve some letters yesterday at around 9am and was welcomed by the lovely sight. Every letterbox had a colourful note pasted on it. It made her day and brought her much joy. This morning, Mr. Chia, (47, self-employed), a resident from the neighbouring block, was attracted by the colourful sight and could not resist walking over to take a look. According to the residents, the notes and gifts they had given in return were no longer there this morning. They believe that the church member stays in the same block. 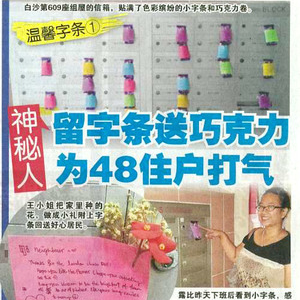 An anonymous student in Nanyang Junior College (NYJC) wrote notes to encourage and cheer the teachers on. This touched the hearts of many teachers. Yesterday, besides the residents of Blk 609 Elias Road, the teachers in NYJC received thoughtful encouragements and gummy bears in their shelves. They were deeply touched by this simple gesture. For the past few days, the youths who initiated the movement have been showing love and kindness in various academic institutions. Their acts of love are going viral. As observed by the reporter, every note was signed off with “#loveothers14”. After searching on the Internet, she found out that these youths have been spreading these little surprises in Nanyang Polytechnic, Temasek Polytechnic, Ngee Ann Polytechnic, along with various Junior Colleges and ITEs over the past week. Also, local blogger Mr. Brown received a cup of hot soup with the same hashtag (#loveothers14) at a local fast food restaurant from two anonymous girls. Additionally, this morning, students from Raffles Institution, Edgefield Secondary School, Meridian Junior College have received the same heartwarming notes with small presents. Love, indeed, knows no bounds.